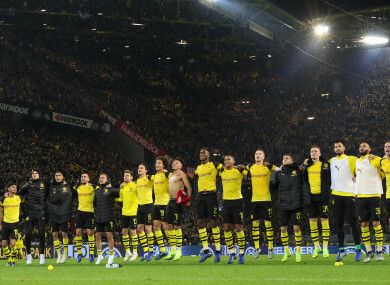 PACO ALCACER SCORED the winner as Bundesliga leaders Borussia Dortmund twice came from behind to beat defending champions Bayern Munich 3-2 and move seven points clear of their third-placed rivals. Tonight’s result piles added pressure on Bayern head coach Niko Kovac, as his side’s chances of winning a seventh straight title in his first season in charge took another blow. Lucien Favre’s Dortmund remain unbeaten and four points clear of second-placed Gladbach at the top of the table. Email “Reus helps Dortmund twice come from behind and beat Bayern Munich”. Feedback on “Reus helps Dortmund twice come from behind and beat Bayern Munich”.